Today is our first day back to work after having two weeks off for the holidays. I haven't at all been looking forward to needing to set the alarm again, so I decided to make this week a lot more fun by creating a new pattern bundle. 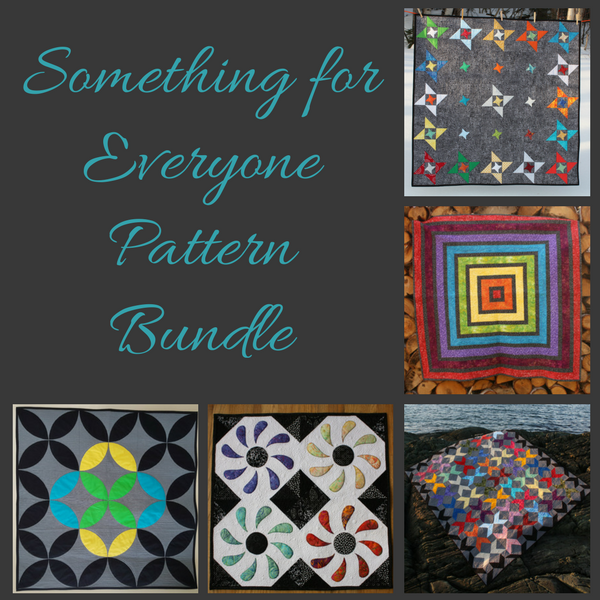 Introducing the Something for Everyone pattern bundle! This pattern bundle includes 5 of my favourite patterns: Love Birds, Mix it Up!, Flower Box, Rainbow Ripple and Friendship Galaxy. Friendship Galaxy includes 4 sizes/layouts for a total of 9 possible quilts! With this bundle you'll have patterns for mini quits (4! ), baby quilts, a throw and a full size bed quilt. Two patterns use machine applique, while all the others are made with traditional piecing. Having 9 different patterns means you can spend less time browsing online for the perfect pattern and more time making. And that means you'll get to make more quilts!